The corporations involved in the conflict are the companies Carbones del Cerrejón Limited and Cerrejón Zona Norte S.A., both owned in equal shares by subsidiaries of Anglo American PLC (UK), BHP Billiton PLC (Australia), and Glencore PLC (Switzerland). Among the actions and activities that caused the conflict is the environmental contamination that is affecting the company’s workers and the inhabitants of both the mining areas and the port, caused by coal, chemicals, and other minerals’ dusts coming from the different activities of the mine. Similarly, there have been several reports of labour irregularities such as exceeding hours of exposition to hazardous environmental contamination or sound pollution from the machinery beyond accepted standards. History of the conflict The project of the mine El Cerrejón started in 1975, when the Colombian government invited 17 firms to participate to the tender for the exploitation of the 32,000 hectares of coal in northern Colombia, in the department of la Guajira, which now constitutes the Cerrejón Zona Norte area. The following year the national company Carbones de Colombia S.A. (Carbocol) and Intercor, a branch of Exxon, signed an association contract for 33 years, which was extended in 1999 for 25 more, until 2034. In 2000 Carbocol sold the 50% of its shares in Cerrejón Zona Norte to a consortium formed by two subsidiaries of Billiton Company, a subsidiary of Anglo American, and a subsidiary of Glencore, which formed the company Cerrejón Zona Norte S.A. In 2002 the three companies also acquired the remaining 50% from Intercor, thus becoming the sole owners and shareholders of Carbones del Cerrejón Limited. In 1983 the Government of Colombia issued a concession to Carbocol relative to some shore areas and beaches in Bahía Portete (Guajíra), and authorized the construction and operation of Puerto Bolívar, the most important port for coal in Latin America, with an initial capacity to receive ships for 180,000 tons. Clearly the mining exploitation supposed an important development, as it established an infrastructure that while responding to the production objectives of El Cerrejón, it would also impact substantially the human and natural environments surrounding it. After six years, and an investment of 3,000 million dollars, the construction and installation of infrastructures in the El Cerrejón Zona Norte area was finalized and the mining operation commenced on a great scale. The Colombian Government left the structure completely in the hands of foreign capital, not only with regards to its administrative, structural, and financial aspects, but also including rights on all the territory that such exploitation embraced, while historically these hosted different tribes of the Wayuu people, some afro-descendent tribes, as well as farmers and citizen of half the department (11.000 km2). 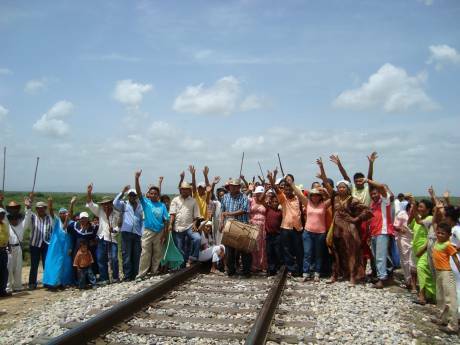 Despite the creation of the System of Cerrejón Foundations in 2008, the occupation and expansion of El Cerrejón caused the forced displacement of entire populations. In 1983, for instance, while El Cerrejón sought expansion of its infrastructures and was growing uncontrolled, much of the ancestral territory of the community of Wayuu of Media Luna was overtaken to build the carbon stocking port. In order to find an appropriate compensation that could allow the relocation of the locals and the transport of the cemeteries, the mining company and the local community were confronted in a fierce discussion, which even entailed physical and verbal threats. The community, however, finally surrendered without fulfilling any of its expectations. Similarly, in 1991 the communities of Caracolí and Espinal, composed by more than 1000 hectares where 350 Wayuu people lived, were destroyed and relocated. The biggest spoil, up to this moment, happened in 2001, when the company Intercor and local authorities forced several afro-colombian families, approximately 1,200 people living in Tabaco, out of their territories,. Mining activities account for 14.2 % of the GDP of la Guajira. Other activities such as commerce or services only amount to 0.7 % and 1 %, respectively. Traditional activities like agriculture, breeding, or fishing, have shrunk starkly due to the expansion of the mining industry, which now uses the lands that were previously destined to these practices. The food sovereignty of the population, therefore, is substantially affected. Environmental contamination of lands, air, and water also affected the health of those populations living close to the mine. The gas emissions, indeed, caused grave conflict, since the gases of coal self-combustion even rise when it rains. In every leak that opens spontaneously carbon fires up, and this generates sulphur oxides, nitrogen oxides, and carbon gas, among other substances. The mining especially and irreversibly affected a fundamental element of the ecological structure: the rivers. The river Ranchería is the main watercourse in an area that would otherwise be desert, providing the refill of aquifers deep until levels of rock and deposits. The course of the Ranchería has allegedly been deteriorated, and its hydrogen cycle was also affected due to deforestation and impact of the project in the area. Other rivers and watercourses have been modified, such as the Aguas Blancas and the Tabaco rivers. Despite the fact that the company monitors the effluents of water from domestic, industrial and residual waters, the reality is that in times of rain one can fin effluents with traces of ammonium nitrate from the explosives factory, or residual waters of the washing of equipment contaminated with grease, oils, fuel traces, and coal. The increase in the magnitude of the operations implied the enhancement of their effects on the environment. Conversely, contention measures were not improved, as the worsening environmental conditions served the purpose to displace affected communities. On top of the contamination of the few existing water sources of the area, El Cerrejón also aims at attacking directly the Ranchería river. The expansion project would in fact need to move the river approximately 25 Km, in order to gain access to 500 million tons of coal located underneath its course. Even if this particular project is temporarily paralyzed, another one is now directly threatening other two minor affluent rivers of the Ranchería. The role of the Architecture of Impunity The cooperation between Colombian institutions and the corporation is very close. This not only opens the gate to corruption, but also hampers legislative reforms that may serve the interests of the affected communities. The vice-Minister of Mining, for example, who was responsible for the reform of the country’s Mining Code in 2001, was also the sales director of Carbocol. This is but one example of the revolving doors pattern that was established. With regard to investment and trade agreements, these instruments gradually conceded to transnational companies political and trading power that allowed them to grow steadily, as well as different fiscal benefits. The boundaries between the State and the transnational companies operating in the country became blurred, especially in the department of Guajira and in El Cerrejón, where the companies assumed complete control of the economy of the whole area, thus affecting key sectors like local infrastructures, education, and health. At the same time, the military and police structures in those areas are now devoted to the protection of the interests of transnational corporations, and are therefore curtailing the freedom of movement of local communities. Since 1997, and with the pretext of fostering some Corporate Social Responsibility programs, the associated companies Carbocol-Intercor have been proposing to the population of Tabaco to accept a lump sum in exchange for their eviction and cession of their rights over the territory. This proposal obviously divided the community between those who sold and left, and those who resisted and looked for a relocation of the population with the aim of preserving their social unity and the desire to continue with a common destiny, hence preserving common traditions of agriculture and breeding allowing them to survive. To evict those who did not accept the compensation offered, the company exerted strong pressures like the suspension of public services in the houses, the burning of cemeteries and houses, prohibitions of transit in the area, the distraction of the watercourse from the river in benefit of the company’s needs, and the eviction of some families – with the support of the Public Forces and in presence of the Public Attorney. It is estimated that investment accumulated in social compensations to the Wayuu communities since 1982 until 2002 was about 5 million dollars in indexed prices for 2002, a sum that represents a production of coal of two and a half days. Attempts to access justice There are actually more than 25 judicial proceedings of different nature in Riohacha and Bogota (popular actions, civil claims for remedy and reparation, criminal suits), both against the State and the company, which are connected to the conflict. Many of them were archived in different phases, or are awaiting judgment in the slow judicial system. None of these actions has strengthened or improved the protection of the rights of the victims. In May 2002 the Supreme Court ordered the Township Mayor of Hatonuevo (Guajira) to rebuild Tabaco in an adequate place, but the judgment that protects the rights of the former inhabitants of the bygone Tabaco still lays unapplied. Amidst the arguments in the proceeding there are medical reports from the company documenting the intoxication of workers with silicon dioxide, coal dust and other chemicals, as well as auditory contamination. The Public Prosecutor also mentioned scientific reports from the World Health Organization’s Agency for Research on Cancer, which establishes that “crystalline SILICE is classified in Group 1, this is, carcinogenic for human beings”. The company Carbones del Cerrejón Ltd. acknowledges the presence of caesium 137 and the Ministry of Social Protection (Technical Counsel Axe 5, Labour Hazards) has among its findings the presence of lid, copper, iron and manganese in quantities way above the permitted standards in many areas of work, as well as the presence of 364 different chemicals. The case of the afro-colombian community of Tabaco was reported again in 2007 before the OECD National Contact Points of Australia and Switzerland, in a process of cooperation between municipalities, the company and the community; the community, nevertheless, after 13 years today continues to be in a status of displacement, has not been relocated, and their rights have not been integrally restored. These conflicts have been documented and dealt with by different organizations and investigators. In particular, there exists much worry for the deficiencies regarding public health, labour safety, biodiversity loss, hydrogen cycle disruption and irresponsibility of the company. What justice could do: an opinion from the PPT In a hearing that was held in Geneva in June 2014, the Permanent People’s Tribunal (PPT) listened to the testimonies of the Colectivo de Abogados José Alvear Restrepo and Ask Switzerland, in coordination with affected communities. In line with the evidence brought before the judges by this witness, the Tribunal recognized the actions of the transnational corporation as another example of violations of human and people rights. In line with its full judgement of Madrid, in May 2010, and just a few months before the session that was subsequently held in Mexico in December 2014, the PPT underlined once again how transnational corporations, including those involved in El Cerrejón, systematically violate human and peoples’ rights to their own profit. In the same line, the PPT recognized in this widespread practice the current shortcoming of international law, namely the impossibility of accessing justice and obtaining a remedy that is increasingly becoming an unbearable burden for affected communities, as well as for the laws that are supposed to give them shelter. In the same spirit, the PPT acknowledged the necessity to improve international legislation, including through a binding treaty on transnational corporations, and/or a peoples’ treaty, in order to hold transnational corporations accountable for their actions. (En Español) Resumen del conflicto Las empresas involucradas en el conflicto son las sociedades Carbones del Cerrejón Limited y Cerrejón Zona Norte S.A., ambas propiedad a partes iguales de compañías filiales de Anglo American PLC (Gran Bretaña), BHP Billiton PLC (Australia) y Glencore PLC (Suiza). Entre los hechos y acciones que motivan el conflicto se encuentra la contaminación ambiental que afecta a los trabajadores de la empresa y a los habitantes de la zona de influencia, tanto de la mina como del puerto, causadas por el polvillo de carbón y otros químicos, elementos y materiales o productos provenientes de las diferentes actividades adelantadas en la mina y el puerto. De igual manera se denuncian irregularidades laborales como las horas de exposición de los trabajadores a la contaminación ambiental y a la contaminación auditiva derivada del ruido generado por la maquinaria. Historia del conflicto El proyecto de la mina El Cerrejón se inició en el año 1975, cuando el Gobierno colombiano invitó a 17 firmas a participar en la licitación para la explotación de carbón de 32.000 hectáreas ubicadas en el extremo norte de Colombia, en el departamento de La Guajira, que actualmente componen el Cerrejón Zona Norte. El año siguiente, la empresa estatal Carbones de Colombia S.A. (Carbocol) e Intercor, filial de Exxon, firmaron un contrato de asociación por 33 años, el cual fue extendido en 1999 por 25 años más, hasta 2034. En el año 2000, Carbocol vendió el 50 % de su participación en Cerrejon Zona norte al consorcio integrado por dos subsidiarias de Billiton Company, una subsidiaria de Anglo American y una subsidiaria de Glencore, que conformaron la Sociedad Cerrejón Zona Norte S.A. En el año 2002, las tres empresas adquirieron el 50 % restante a Intercor, convirtiéndose así en dueños únicos por partes iguales de Carbones del Cerrejón Limited, cuyos accionistas son subsidiarias de las tres compañías antes mencionadas. Ya en 1983, el Gobierno de Colombia otorgó en concesión a Carbocol unas zonas de playa y terrenos de bajamar en Bahía Portete (Guajira) y autorizó la construcción y operación de Puerto Bolívar, el puerto carbonífero más importante de América Latina, con capacidad inicial para recibir barcos de hasta 180.000 t. de peso muerto. Claramente la explotación minera presentaba un importante crecimiento histórico, estableciendo una infraestructura que si bien responde a los objetivos de producción de El Cerrejón, representaría un evidente impacto en los entornos naturales y humanos. Después de seis años, y con una inversión de 3.000 millones de dólares, se finalizó la etapa de construcción y montaje de las instalaciones e infraestructura de El Cerrejón Zona Norte que dio inicio a la operación de minería en gran escala. El estado colombiano dejó en manos del capital extranjero no solo el componente administrativo, de infraestructura y financiero de El Cerrejón, sino también todo el territorio en el cual se presenta dicha explotación, que históricamente corresponde a los diferentes clanes Wayuu, algunas comunidades afrodescendientes, campesinos y ciudadanos de más de la mitad del departamento (11.000 Km2). A pesar de la creación en 2008 del Sistema de Fundaciones Cerrejón, internamente se puede observar que la ocupación y expansión de El Cerrejón ha generado el desplazamiento de poblaciones enteras. Por ejemplo, en el año 1983, mientras El Cerrejón buscaba la ampliación de su infraestructura y crecía sin control, gran parte del territorio ancestral de la comunidad wayuu de Media Luna fue usurpado para construir el Puerto de Embarque de Carbón. La empresa minera y la comunidad se enfrentaron, en una negociación de fuertes discusiones y amenazas físicas, para lograr una justa indemnización que permitiera la reubicación de los locales y el traslado de los cementerios. La comunidad cedió finalmente, sin tener éxito en sus expectativas. De igual manera fueron destruidas y reubicadas en 1991 las comunidades Caracolí y Espinal, que comprendían 1000 hectáreas de tierras y donde vivían 350 personas wayuu. El despojo más grande, hasta ahora, tuvo lugar en agosto de 2001 cuando la compañía Intercor y las autoridades locales obligaron a salir de su territorio a familias afrocolombianas, aproximadamente mil doscientas personas que habitaban en el corregimiento de Tabaco. La minería aporta el 14,2 % del PIB de la Guajira. Actividades como el comercio o los servicios representan solo el 0,7 % y el 1 % respectivamente. Las actividades tradicionales, como el cultivo de alimentos, el pastoreo de los animales, o la pesca han disminuido por la expansión de la industria minera, que utiliza los terrenos anteriormente destinados a estas prácticas. La soberanía alimentaria de la población, por tanto, se ve severamente afectada. La contaminación ambiental de los suelos, del aire y del agua afectó también la salud de las poblaciones vecinas de la mina. La emisión de gases constituye un grave conflicto, debido a que los gases de la auto-combustión del carbón, aumentan cuando hay lluvias. En todos los tajos abiertos de manera espontánea se prenden mantos de carbón y generan óxidos de azufre, óxidos de nitrógeno y gas carbónico, entre otros. La minería afectó especialmente y de manera irreversible un elemento fundamental de la estructura ecológica: los ríos. El río Ranchería es el principal cuerpo de agua de una zona por demás desértica, donde la recarga de acuíferos se da desde estos hacia niveles profundos de roca y depósitos. Se presume que ha existido un deterioro de la cuenca del río Ranchería y se ha afectado el ciclo hidrológico debido a la deforestación e intervención del proyecto en el área. Se han modificado arroyos y cuerpos de agua, como por ejemplo el arroyo Aguas Blancas y el arroyo Tabaco. A pesar de que la empresa tiene un monitoreo de los efluentes de aguas residuales domésticas e industriales, la realidad es que en épocas de lluvia se presentan efluentes con trazas de nitrato de amonio de la planta de explosivos, aguas residuales de la planta de lavado de equipos con contenidos de grasas, aceites, trazas de combustible y carbón mineral. Aumentar la magnitud de las operaciones implicó aumentar los efectos sobre el medio ambiente implícitos en ella. No se aumentaron las disposiciones de contención porque se utilizaron como medida de presión para desplazar a las comunidades. Además de la contaminación de las pocas fuentes fluviales ya existente, en la actualidad El Cerrejón pretende atacar de manera directa el río Ranchería. El proyecto de expansión necesitaría trasladar el río por aproximadamente 25 km para así acceder a las 500 millones de tonelada de carbón ubicadas en su cauce. Aunque este proyecto está paralizado actualmente, otro proyecto paralelo amenaza dos afluentes más pequeños del río. El papel de la Arquitectura de la Impunidad La cooperación entre las instituciones colombianas y la empresa son muy estrechas. Esto no solo abre paso a la corrupción sino que además obstaculiza reformas legislativas que puedan servir los intereses de las comunidades afectadas. Por ejemplo, la viceministra de Minas, quién fue responsable de la reforma del código minero en 2001, fue también directora de ventas de Carbocol. Es tan solo un ejemplo del patrón de ‘puertas giratorias’ establecido. Los acuerdos de inversión económica y tratados de comercio, además de los beneficios fiscales, han concedido un poder comercial y político de crecimiento constante a las empresas transnacionales. Los límites entre Estado y empresas transnacionales se han vuelto borrosos, especialmente en el departamento de la Guajira y el caso del Cerrejón; la empresa ha asumido el control de una economía de enclave incidiendo en sectores de infraestructura, de educación y de salud. Al mismo tiempo, las estructuras militares están dirigidas hacia la protección de los intereses de las empresas transnacionales e impiden el derecho a la libre circulación de las comunidades. Desde el 1997, las empresas asociadas Carbocol-Intercor han propuesto a los pobladores de Tabaco, bajo el pretexto de programas de Responsabilidad Social Empresarial, entregarles una cierta cantidad de dinero para que individualmente desalojen y cedan los derechos sobre el territorio. Esta propuesta divide a la comunidad entre los que vendieron y se fueron, y los que se resisten y buscan una reubicación de la población, con el ánimo de conservar su unidad social y el deseo de continuar con un destino común, conservando las tradiciones agrícolas y ganaderas que les han permitido sobrevivir. Para desalojar a los que no aceptaron la compensación ofrecida, la empresa utilizó presiones como la suspensión de los servicios públicos y domiciliarios, quema del cementerio y viviendas, prohibición del tránsito en el territorio, desvío del agua del río en beneficio de la compañía, desalojo con apoyo de la Fuerza Pública y en presencia de funcionarios de la Fiscalía. Además, se estima que la inversión acumulada desde 1982 a 2002 en compensaciones sociales a las comunidades wayuu ha sido cercana a 5 millones de dólares en precios constantes del 2002, que representa tan solo la producción de carbón de dos días y medio. Intentos de acceso a la justicia Existen más de 25 procesos jurídicos de diferente índole (acciones de tutelas, acciones populares, acciones de reparación, etc.) contra el Estado y contra la empresa ante distintos tribunales en Riohacha y Bogotá. Muchos de ellos fueron denegados en las distintas instancias o se encuentran en demora procesal en el sistema jurídico. Ninguna de las acciones ha fortalecido la protección de los derechos de las víctimas afectadas. Además, en mayo de 2002, la Corte Suprema de Justicia ordenó al Alcalde Municipal de Hatonuevo (Guajira) reconstruir Tabaco en un lugar adecuado, pero el fallo que tutela los derechos de los pobladores del desaparecido Tabaco no se ha cumplido. Entre los argumentos de la demanda se encuentran informes médicos de la empresa que documentan la afectación de los trabajadores con sílice libre, polvo de carbón y otras sustancias químicas, así como contaminación auditiva (ruido). La Procuraduría cita informes científicos de la World Health Organization Agency for Research on Cancer que establecen que 'el sílice cristalino es clasificado en el Grupo 1, es decir, Carcinógeno para humanos'. La empresa Carbones del Cerrejón Ltd. acepta la presencia de cesio 137 y el Ministerio de Protección Social (Asesoría Técnica Eje 5. Riesgos Profesionales) tiene entre sus hallazgos presencia de plomo, cobre, hierro y manganeso que superan los niveles permisibles en algunas zonas de trabajo y reporta presencia de 364 sustancias químicas. El caso de la comunidad afrocolombiana de Tabaco fue denunciado de nuevo en 2007 ante los Puntos Nacionales de Contacto de Australia y Suiza de la OCDE en un proceso de concertación entre municipio, empresa y comunidad; no obstante, la comunidad sigue hoy en día, luego de 13 años, en estado de desplazamiento, no ha sido reubicada y sus derechos no han sido reparados integralmente. Estos conflictos han sido documentados y tratados por diferentes organizaciones e investigadores, En particular, existe preocupación por deficiencias en salud pública, en seguridad laboral, la pérdida de biodiversidad, la afectación al ciclo hidrológico y la irresponsabilidad de la empresa. Lo que la justicia podría hacer: una opinión del TPP En la sesión en Ginebra de junio, 2014, el Tribunal Permanente de los Pueblos (TPP) escuchó el testimonio de miembros del Colectivo de Abogados José Alvear Restrepo y Ask Suiza, en coordinación con las comunidades afectadas. De acuerdo a lo expuesto ante los jueces del tribunal, éste reconoció las acciones de la corporación transnacional como otro ejemplo de violaciones de derechos humanos y de los pueblos. De acuerdo a la sentencia de Madrid, en mayo de 2010, y unos meses antes de la sesión que tuvo lugar en México en Diciembre 2014, el TPP resaltó de nuevo cómo las corporaciones trasnacionales, incluidas las implicadas en El Cerrejón, violan sistemáticamente estos derechos para su propio beneficio. El tribunal reconoció en esta extendida práctica la evidente limitación del derecho internacional. La imposibilidad del acceso a la justicia y a obtener remediación está convirtiéndose en una carga cada vez mayor para las comunidades afectadas, así como las leyes que deberían protegerlas. Así mismo, el TPP reconoció la necesidad de mejorar la legislación internacional, incluyendo un tratado vinculante para las corporaciones transnacionales y un Tratado de los Pueblos, para que así estas empresas sean consecuentes con sus acciones. Project Details El Cerrejón presenta cinco zonas de explotación minera a cielo abierto ubicadas en el departamento de la Guajira; este proyecto genera más del 60% de la producción carbonífera en Colombia que se expresa en 32 millones de toneladas métricas de carbón térmico al año, lo cual representa el 50% de las exportaciones carboníferas colombianas, entre ellos: Dinamarca, Irlanda, Finlandia, Estados Unidos, España, Israel, Puerto Rico y Brasil. En términos generales existen dos tipos de carbón: el carbón térmico que es utilizado principalmente en la generación de energía y el carbón de coque o carbón metalúrgico que se utiliza principalmente en la producción de acero. Otros usuarios importantes de carbón son las refinerías de alúmina, los fabricantes de papel y las industrias farmacéuticas. Varios productos químicos pueden ser producidos a partir de los subproductos del carbón. El alquitrán de hulla refinado se utiliza en la fabricación de productos como el aceite de creosota, naftaleno, fenol, y el benceno. El gas de amoníaco recuperado de los hornos de coque se utiliza para fabricar sales de amoníaco, ácido nítrico y fertilizantes agrícolas. Presentation to the case to the Permanent Peoples Tribunal. Creación de la iniciativa "Fuerza de Mujeres Wayuu": es una de las experiencias organizativas de La Guajira. Entre sus objetivos está conseguir que las comunidades y las familias comprendan, asimilen y hagan suya la situación del pueblo Wayúu. Enfatiza en la relación que hay entre megaproyectos y los desplazamientos forzados o aquellos que técnicamente, las empresas y el Estado, llaman ‘reasentamientos voluntarios’. Los impactos de la extracción de carbón en la Guajira han llevado a que se deterioren los significados de las relaciones de las mujeres con la naturaleza, pues se intensifican situaciones de poder jerárquicas que perpetúan el machismo y experiencias como la discriminación, la criminalización y la estigmatización, situaciones que han vivido distintas integrantes de Fuerza de Mujeres Wayuu. La presencia de la extracción de minería a gran escala ha generado que haya violencia económica contra las mujeres, ya que hay feminización del desempleo, desigualdad salarial. De la misma manera las mujeres se han visto afectadas por la dificultad en acceso a la salud, alimentación y educación. Sumado a todo lo anterior, los cambios y deterioros del ambiente producidos por la minería han implicado que las mujeres que se dedicaban a la agricultura han tenido que cambiar sus labores o luchar mucho más para acceder a bienes como el agua en una calidad y cantidad aceptable. Development of Alternatives -En el caso de las comunidades que han sido desplazadas por la explotación del Carbon en la región, se ratifica la sentencia de la Corte Suprema de Justicia del 7 mayo de 2002 que garantice la reubicación de la población en condiciones dignas. -La alternativa propuesta por los habitantes de la comunidad Wayuu que nuevamente sera objeto de reubicación, pero que esta vez involucra el recurso más preciado que tiene la comunidad que es el rio Rancheria, la alternativa es firme y contundente: que no se permita a la empresa extranjera Cerrejón destruir el acuífero natural que mantiene el Ranchería y seque la única fuente de agua de la media y alta Guajira. Why? Explain briefly. Un elemento indispensable en el caso de El Cerrejon es la existencia de la sentencia de la Sala de Casación Civil de la Corte Suprema de Justicia, que desde el año 2002, un poco menos de un año después de la destrucción ilegal, ordenó, en cabeza del Municipio de Hato Nuevo, acciones tendientes a la reconstrucción del tejido social del pueblo, incluyendo la vivienda, y a garantizarle protección de otros derechos igualmente fundamentales de la frágil comunidad afectada. Sin embargo no se considera como victoria pues el proceso ha sido lento, y en la actualidad la empresa sigue buscando ampliar las fronteras del carbon en la region, a pesar de la presencia de la comunidad Wayuu en la zona. Friends of the earth, Quiten las manos de nuestros recursos naturales!, 2003. Mision internacional de Verificacion a la situacion humanitaria, Ustedes Mision, son fuego, agua, viento y plantas, 2006. CENSAT (2011). Resumen del Proyecto de Expansión Iiwo´uyaa para grupos de interés. Gustavo Valbuena, Las salinas de los Wayuu, 2005. Karmen Boscn, Desde el desierto. Notas sobre paramilitares y violencia en territorio wayuu de la media Guajira, 2007. Sabine Kienzl, Reporte preparativo para la mision internacional de verificacion de laverdad en pueblos indigenas en Colombia, 2006. Fotos de "Tabaco: el pueblo al que se lo tragó una mina"
Other Comments Impactos especificos sobre mujeres: "Los impactos de la extracción de carbón en la Guajira han llevado a que se deterioren los significados de las relaciones de las mujeres con la naturaleza, pues se intensifican situaciones de poder jerárquicas que perpetúan el machismo y experiencias como la discriminación, la criminalización y la estigmatización, situaciones que han vivido distintas integrantes de Fuerza de Mujeres Wayuu. Sumado a todo lo anterior, los cambios y deterioros del ambiente producidos por la minería han implicado que las mujeres que se dedicaban a la agricultura han tenido que cambiar sus labores o luchar mucho más para acceder a bienes como el agua en una calidad y cantidad aceptable."